In Icinga 1 we had so-called Timeperiod excludes for that. The calculation (current time inside the time period?) and checks were considerably buggy. Icinga 2 pre-calculates the available time segments for the current day beforehand. Once there are additional includes and excludes defined, Icinga 2 needs to ensure to properly merge those segments. Imagine that you want to exclude the generic “holidays” time period from your default notifications. Define a new TimePeriod object and add the time range definitions. We’ve updated the documentation to add more details on the specific syntax as well. Going further, your NOC team should only get notified from 9 to 6 (where their reaction onto ticket costs extra money). Add a secondary TimePeriod object you’ll like to exclude, called “weekends-excluded”. Now combine the two exclusions into your generic “prod-notification” TimePeriod object. The important part here: “excludes” is defined as an array of TimePeriod object names. The order is important for merging the available time range segments. You can of course try to create custom ranges statically inside the “ranges” attribute. If the time period matches but your co-worker is on holiday, you can filter away the notification at the User object level too. Important note: If you are using includes and excludes at the same time, you need to define the default merge strategy with “prefer_includes“. This defaults to true. In case you want to test whether the current timestamp is inside the defined TimePeriod object time range, Icinga 2 offers the “is_inside” runtime attribute. 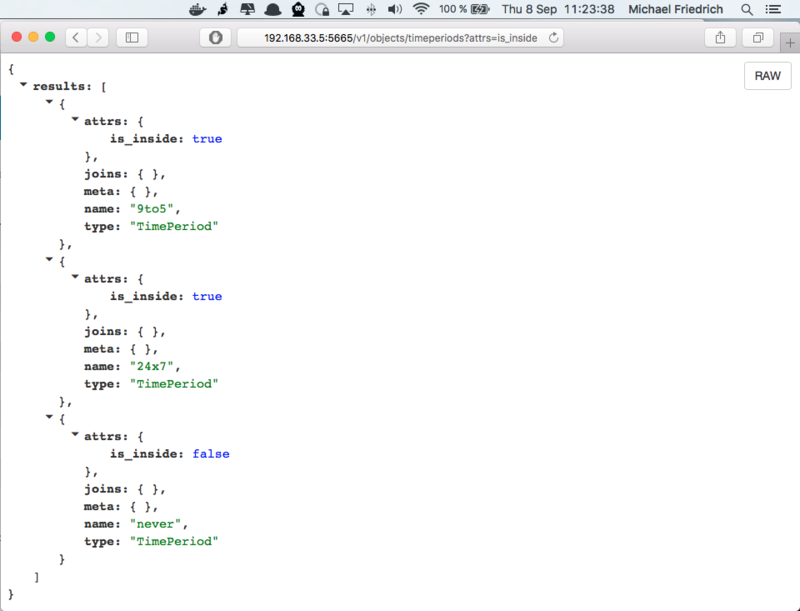 You can either query that from the REST API endpoint /v1/objects/timeperiods or using object accessor methods to e.g. define dynamic thresholds. There are presumingly more use cases out there – let us know how you are using the Timeperiod excludes and includes in your setup! Additional details can be found in the documentation. A huge shoutout to Philipp Dallig for his feature contribution. Grant him a beer or two if you like the new TimePeriod exclude/include possibilities in Icinga 2 v2.5! If you want to learn more about Icinga 2 and its possibilities, join us at the upcoming Icinga Camps – Belgrade, Stockholm, San Diego and Berlin. We’re glad to have him working with us and I’ll make heavy use of this feature in the upcoming migration to Icinga 2.5! definition is missing the object type. there is no such thing as 24:00.